Jesus said to his disciples: “Be watchful! Be alert! You do not know when the time will come. It is like a man traveling abroad. He leaves home and places his servants in charge, each with his own work, and orders the gatekeeper to be on the watch. “‘Ego sum via, veritas et vita.’ ‘I am the way, the truth and the life.’ In these clear and unmistakable words Our Lord traces out for us the true path that leads to everlasting happiness. Ego sum via: he is the only road linking heaven and earth. He is speaking to all men, but in a very special way he is thinking of people who, like you and me, are determined to take our Christian vocation seriously, so that God may always be present in our thoughts, on our lips and in everything we do, including our most ordinary and routine actions. “Jesus is the way. Behind him on this earth of ours he has left the clear outlines of his footprints. Do I realize that God is calling me to serve Him in and through my daily life and activities? Do I watch for the ways God is preparing me to serve Him? Do I prepare my soul in confession, Holy Communion, and penance to deal effectively with the joys and sorrows of life? 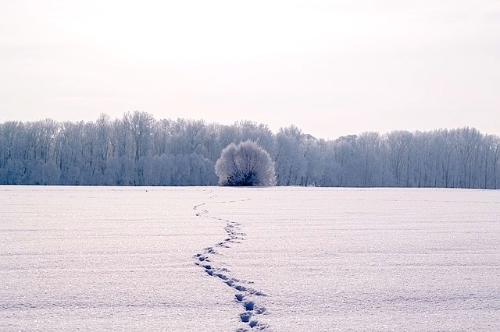 FOOTPRINTS IN THE SNOW: LORD, THAT I MAY SEE! It may seem surprising that a little thing like footprints in the snow was enough to make St Josemaria Escriva, a teenager at the time (1918), take the great decision to give his life to God. But that is the language God often uses to call people, and that is how generous souls who seek God sincerely are capable of responding, with faith. You are receiving this email because you provided your information in the past to the St. Josemaria Institute or subscribed online. Click here to unsubscribe from this list or to update subscription preferences. Copyright © 2014 St. Josemaria Institute, All rights reserved.